Wood Fresh Hardwood Cleaner is used in the Wood-Fresh Wood Floor Preservation System abrasion cleaning system with a rotary floor machine and maroon pad to remove the surface soil and the embedded dirt. It will also remove scuff marks and other imperfections. 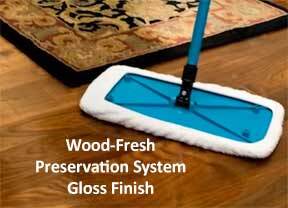 Wood Fresh Hardwood Cleaner is the ideal cleaner to prepare the floor for the application of the Wood-Fresh Wood Floor Preservation Finish Gloss or Satin. It is also the ideal cleaner for daily maintenance of the floor. 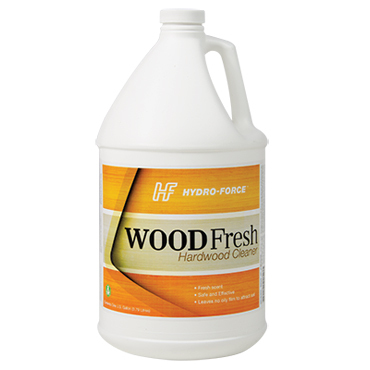 Wood Fresh Hardwood Cleaner can be used by the home owner to clean wood floors as often as needed. Leaves no oily film to attract soil. The Wood Floor Preservation system is designed to preserve a hardwood floor that is already in fairly good condition, but the customer wants to keep it that way. It is designed for floors simply needing to be cleaned and brightened up with light coats of the Wood-Fresh Finish. Restrictions on Use: Keep out of reach of children. Form: Clear Light Blue Liquid . Use Concentration: 1:4 with water. Storage: Protect product from freezing. Keep in dark in cool, fireproof surroundings. Do not store above 120 F. Keep container tightly closed & upright when not in use. 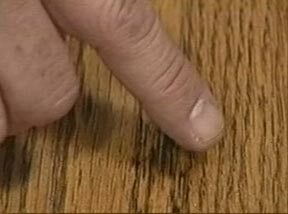 Flammability: Flashpoint >201 degrees F.
Determine if there is finish on the wood by placing drops of water in several places to see if it penetrates into the wood as evidenced by darkening. If there is no finish present (bare wood), do not use the water-based wood floor preservation system - use the Wood-Solv system instead. Test the floor whether it is coated with aluminum oxide. In an inconspicuous area, lightly abrade the floor with sandpaper. If the floor is unaffected, it is coated with aluminum oxide - use the Wood-Solv system instead. Be aware that many such floors carry a warranty that is voided if a finish is applied to it. Inspect the floor for damage to the wood and the existing finish. 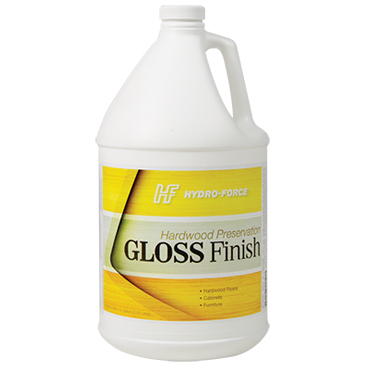 Also check for wax, oil and soap coatings such as Orange Glo, Murphey® Oil Soap, Holloway House®, Mop & Glo®, etc. Apply a small amount of alcohol on a towel and apply to an inconspicuous area that the customer has been “cleaning”. If the finish comes off or turns cloudy, the “gunk” must be removed before proceeding. 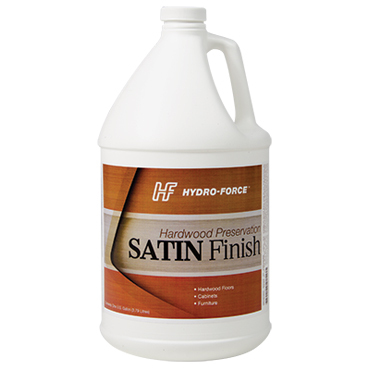 No water-based finish, including Wood Preservation Finish, will adhere to waxes or oils. The preinspection and prequalification step is essential for the success of each job. The system emphasizes the importance of preserving the original finish, so hopefully the customer will never have to go through the messy process of sanding and recoating their hardwood. This system does not make damaged or heavily scratched floors look like new. Floors in that condition should be restored using the Wood-Solv process or may need to be sanded or screened and refinished. Read label directions and cautions before using. Always test on a hidden or inconspicuous area first. Move out any furniture or other objects that may be in the way. 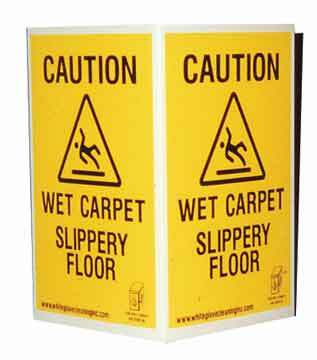 If doing this job in an industrial or commercial setting, set out your Caution Signs and Caution Pads. Dust mop or vacuum (without the beater bar) the floor thoroughly. Mask off floor vents, baseboards and transitions from wood to other types of floors and with masking tape. Mix 4 parts water to 1 part Wood Fresh Hardwood Cleaner in a sprayer. Spray a light mist application to a small section of the floor (about 10x10). Do not allow the cleaner to dry before cleaning. With a low speed floor machine (175 rpm), scrub the floor with a maroon floor pad. Because this is a inch pad, it is best to place a white floor pad between the maroon pad and the driver block to offer cushioning and prevent any damage to the floor as shown here. Do not allow the cleaner to dry before cleaning. Wipe up residue as you go the Wood-Solv mop cover or the Microfiber Wood Finish Applicator Mop. Be careful not to over-apply Wood Fresh Hardwood Cleaner as excess water on the floor can cause damage. The scrubbing action will loosen and remove soil build-up as well as the surface of the old finish, leaving a surface that has a slightly rough feel. This new surface will readily accept and bond to the Hardwood Preservation Finish. NOTE: Aluminum oxide coated floors will not be abraded; therefore, the finish will not adhere! Mop the floor with a Wood-Solv mop cover or a Microfiber Wood Finish Applicator Mop to absorb the Wood Fresh Hardwood Cleaner and the released soil. Repeat this mopping procedure a second time. Spray the floor with a light coat of Wood Fresh Hardwood Cleaner and buff the floor with your floor machine and a cotton bonnet (absorbent pad). While wearing shoe booties, go over the floor a final time with a damp clean terry cloth cover attached to the applicator. This will remove any dust or lint before applying finish. In corners and along the edges of the floor, you will need to accomplish the above procedures by hand. You may remove the center portion of the maroon pad or use a Doodle Bug scrubbing pad for this handwork. You are now ready to apply Hardwood Preservation Finish as soon as the floor is dry. Depending on conditions, this could take up to 1 hour. Hardwood floors are generally dirty - much dirtier than most customers realize. This gives the professional an option for cleaning only. Using Wood Fresh Preservation Cleaner with a quality machine will make a big difference in the look of a soiled floor. If cleaning is performed without the preservation finished being applied, avoid shoe traffic for two hours following the cleaning. For best results, apply the cleaner to your floor with a sprayer or squirt bottle, then quickly wipe away the solution with a dry mop or cloth until it is close to dry. It is also important to clean spills immediately, and spot clean when needed to extend the life of your floors. NOTE: Soaked mops should never be used on hardwood floors. This is known to cause extensive damage. Hardwood flooring products containing ammonia or oil soaps should also be avoided. These ingredients ruin the urethane finish and causes hardwood to warp. Click the “Usage & Tips” tab above for article titled “Wood-Fresh Water-Based Wood Floor Preservation System”.